Proud Mary cruises are designed to provide a perfect balance of activity and relaxation. You’ll revel in the peace and quiet of cruising Australia’s biggest river and getting to know the flora and fauna of the various areas as you glide by. There is abundant wildlife to see during the day and at night thanks to state-of-the-art LED floodlights which illuminate the banks, making it easy to observe nocturnal activity on shore. And of course, the magnificent and changing River scenery provides a breath-taking backdrop each day of your cruise. Throughout your cruise, you’ll enjoy a range of shore-based tours and experiences. A journey aboard a small boat to cruise the River’s secluded lagoons and inlets, where you will view some of the 320 species of birdlife in this region and discover the intricacies of the ancient cliff face. The Nocturnal Discovery is an insight to abundant wildlife, including the Southern Hairy Nosed Wombat, floodlights illuminate the secluded outback enabling you to easily view the native flora & fauna. A visit to Murray Aquaculture, one of the most ambitious aquaculture projects undertaken in Australia. With a local guide, visit the interpretation centre, ponds and nurseries, where they breed yabbies, a uniquely Australian freshwater crustacean. 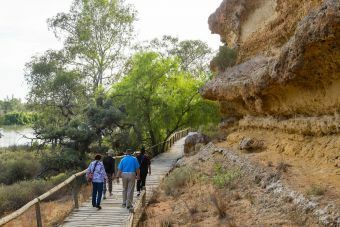 Take a fascinating guided nature walk through Reedy Creek Conservation Park, more commonly known as Mannum Waterfalls. Discover this permanent water course from waterfalls, through swamps and wetlands. Journey into history at Ngaut Ngaut Aboriginal Conservation Park, one of the oldest archaeological digs in Australia. In 1929, burial grounds, tools and art were discovered revealing facts about life on the River over 8,000 years ago. Here you are met by a local Aboriginal Guide and will discover galleries of cave art and smoke stains from ancient fires and artifacts unearthed by archaeologists. Riverbank Barbeque – As dusk falls, enjoy an evening around a blazing campfire. A delicious bush barbeque is prepared by our resident chefs using local produce, including billy tea and damper, along with live entertainment under the stars on the golden sands of the river bank.